The several funnel logo's and flags of HAL. For the stupid new logo of 2015 see below. April 18-1873 in Rotterdam - The Netherlands as "Nederlandsche - Amerikaansche - Stoomvaart - Maatschappij" [NASM] First ship "Rotterdam I " Due to the very difficult pronouncing of this name by English speaking travellers is added a second name "Holland - Amerika Lijn" or HAL in 1896. 1895 - Rotterdam-2 more or less the very first cruise in history of the HAL to North Germany. 1901 - Soestdijk-1 the first full freighter with shipname ended on "-dijk". 1938 - Nieuw-Amsterdam II enter service. The most beautiful ship ever built in the Netherlands. 1940-1945 WWII - 12 ships lost 177 crew members died. 1948 - 75 years anniversary. 1959 - Rotterdam-V enter service. 1963 - Moved USA headquarters and operations from Hoboken -New Yersey to Manhattan-Pier 40. 1969 - Rotterdam-V ceased transatlantic passengerservice. After refit cruises only. 1971 - HAL ceased transatlantic passengerservice. 1971 - HAL acquired 70% share in Westours Inc-Seattle. 1972 - HAL acquired the Argentina and Brasil of Moore Mc.Cormack Lines Inc.-USA and renamed into Veendam-III and Volendam -II. 1972 - The first Lash-ship Bilderdijk-2 enter service. 1973 - Prinsendam the first special designed cruiseship enter service.Last HAL ship built in the Netherlands. 1974 - "Nieuw-Amsterdam" II sold for scrap to Taiwan. According to many the most beautiful passenger ship ever built. Incotrans bv.-Rotterdam. Ships sailing under Dutch flag with Dutch officers. 1978 - Moved its headquarters from Rotterdam to New York. 1980 - First fatal accident with a HAL ship after WW-II. "Prinsendam" sunk in Gulf of Alaska after fire. All passengers and crew rescued. 1983 - HAL acquired 100% share in Westours Inc-Seattle. 1987 - HAL acquired 50% share in Windstar Cruises. 1988 - HAL acquired 100% share in Windstar Cruises. 1988 - Nov. a very sad and unbelievable decision for the maritime history of the Dutch. Carnival Corp. acquired the HAL for about $900 milj.in total. The deal effected in 1989 Jan.
1998 - "Westerdam"2 lenghtened by 40m. at Meyer Werft - Germany. 1997 - Grande Dame "Rotterdam"-5 out of service and sold to Premier Cruises. Renamed "Rembrandt". 1998 - 125 years anniversary. After Cunard the oldest cruise/passengerline in the World. 2000 - The "Nieuw-Amsterdam" 3 sold to ACVC and renamed as "Patriot". A great name in HAL history leaved. 2001 - Because of payment problems by ACVC "Patriot" returns to the HAL under old name. 2002 - The "Nieuw-Amsterdam" 3 on bareboat charter to Louis Cruises Cyprus. 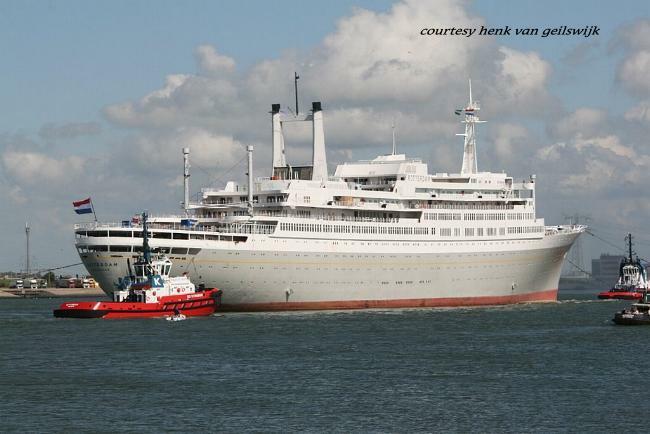 2002 - Grande Dame "Rotterdam"-5, will return to her homeport in 2005 after important work has been carried out. In the Caribbean, she will be restored and come out in her original, grey hull. She will be permanently berthed in the harbour of Rotterdam. 2002 - "Westerdam"-2 sold to Costa Cruises new name "Costa Europe". advanced , most luxurious and biggest, ever built in history of the HAL. by Princess Margriet of the Netherlands on july 29. 2004 - The third Vista-Class ship the "Westerdam"-3 will enter service on april. 2004 - "Noordam" sistership of the "Nieuw-Amsterdam" goes in charter for Thomson -UK as "Thomson Celebration". Both ships are the last ships built and designed by the Dutch HAL. 2005 - Carnival order biggest ship for HAL ever with option on second. It will be called "Signature Class". It will be more or less an enlarged Vista class. Tonnage approx. 86.000 gt. Delivery in 2008. 2006 - The "Veendam" the last ship registered in The Netherlands out of the Bahamian flag. Ceremony take place at january.2006. 2006 - The " Noordam" the last Vista ship starts operations in januari. 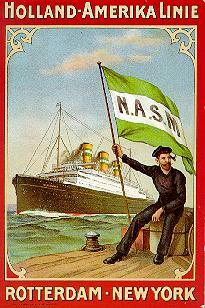 It is the fourth ship in HAL-history that bear the name of Noordam. 2006 - The new "Signature Class" (enlarged Vista type) ship will be named "Eurodam". A fancy name without any historical meaning. 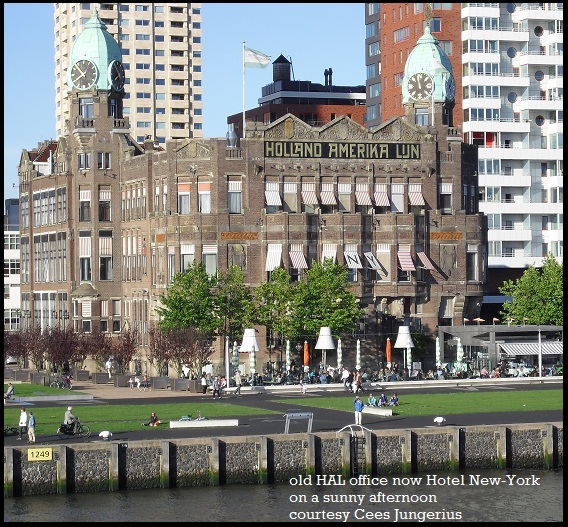 2007 - Carnival announced that the European HAL office will be located in Rotterdam. After 36 years the HAL is back in their homecity Rotterdam. 2007 - Carnival changed option of second "Signature Class" in a fix order with delivery in 2010. 2008 -August 4 The Rotterdam 5 back home after many years of renovations. Now, permanent berth in her hometown. Is now a hotel / conference ship available for visits. Please visit page Triomftocht. 2009 - As part of its ongoing Signature of Excellence. Veendam and Rotterdam converted. Increase passengers of the Statendam -class to 1350 and the Rotterdam to 1404. The Statendam-Ryndam and Maasdam will follow. 2010 - Second "Signature Class" enter service named "Nieuw-Amsterdam"-4 a famous historic HAL name. Naming ceremony with Princess Maxima in Venice. 2011 - HAL increasing number of cruises out of the Netherlands with 50%. 2011 - Seabourn moves to HAL organisation in Seattle. 2012 - HAL gets own Tulip.The tulips are scheduled to bloom in the spring. 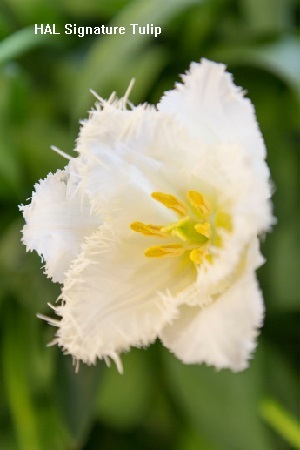 An official christening and naming of the new tulip will be held in April 2013 during the company’s 140th anniversary. 2013 - In celebration of its 140th anniversary, an official christening of the new Holland America Line “Signature” tulip took place in the Netherlands on Friday, April 19 at the world-famous Keukenhof Gardens. President and CEO of Holland America Line Stein Kruse participated in the ceremony along with the President of the Board of Directors of Keukenhof Walter Jansen and Master Grower Jan Pennings. 2013 -Dec. Holland-America Group is founded with CEO Stein Kruse former HAL CEO. Group consists of HAL, Princess, Seabourn and P&O Australia. 2014 - May 19-Announcement Statendam and Ryndam left fleet in 2015 by internal transfer within Carnival Corp. to P&O Australia. Start operations for P&O-Australia under new name; Pacific Aria and Pacific Eden. Nov. 21, 2014 - Holland America Line announced today that effective Dec. 1, Orlando Ashford will join the company as president. 2015 - Oct.29 - Orlando Ashford announces new strategy. Reinventing its cruise experience with three new content providers BBC earth, Afar and Utrip for onboard enrichment, and a new logo and a new slogan. In particular, the new logo is a meaningless ship's bow without the Half Moon a ship that the age of the HAL represented. 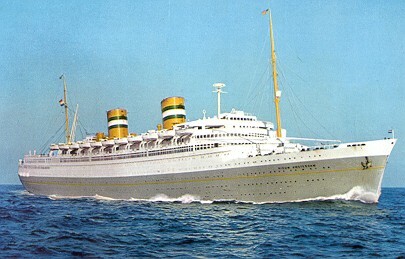 Along with the bow of the Nieuw Amsterdam -2 of 1938 one of the finest ocean liners. At the time of introduction of this new logo 143 years old one of the oldest existing shipping companies. It is incomprehensible that the lovely old logo has been replaced by this monstrous meaningless new logo. This can only be done by someone who has no respect of the history of the company. Some hypocrite US staff members found that the emblem with the Half Moon called too much association with the "slaves" time. Absolutely misplaced. Hopefully they can take a closer look at the history of the shipping company. 2016 - Jan. Cooperation between HAL and Dutch Rijksmuseum at Amsterdam. On board a collection of fine art news and video's under the name "Rijksmuseum at Sea." 2016 - May 20-Rotterdam, the Netherlands. Her Majesty Queen Máxima of the Netherlands officially blessed the bell and named Koningsdam onboard the ship in front of invited dignitaries, cruise guests, travel partners and media. Please Click here. 2016 - May 20-Rotterdam, the Netherlands. Holland America Line announced today that the name of the next Pinnacle Class ship set for delivery in fall 2018 will be Nieuw Statendam. 2018 - March Pacific Eden ex. Statendam sold to Cruise and Maritime Voyages. Renamed: Vasco da Gama. 2018 - April 18 -145 years anniversary. 2018 - Dec. Second Pinnacle class ship Nieuw-Statendam hand over by builder Fincantieri to HAL. 2019 - Holland America Line announced that its next Pinnacle Class ship will be called Ryndam. Delivery may 2021 the fourth ship to bear this name. Fortunately not with the stupid "Nieuw" for the name. 1899 Funnel Yellow with green-white-green band on. Hull: Black with yellow line. 1973 Funnel Orange with 3 horizontal streamers in the colours bleu-white-blue. Hull: Dark blue. 1983 Funnel White with 3 horizontal streamers in the colour bleu. Hull: Dark blue. 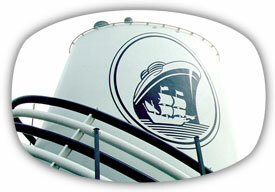 1989 Funnel White with oval logo of the Haelve Maen (Half Moon) and bow of the Nieuw-Amsterdam II. Hull: Dark blue. 2016 Funnel White with oval logo of the Haelve Maen (Half Moon) removed. Only a bow of probably of the Nieuw-Amsterdam II. This is the most stupid change ever.